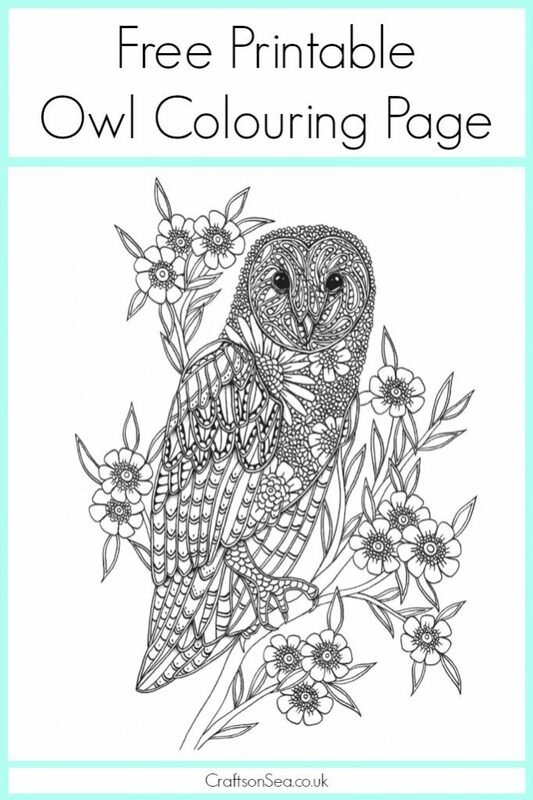 Today I’m sharing with you this gorgeous free owl colouring page. This fantastic design is from Georgie Woolridge’s book Birds: A Mindful Colouring Book and as well as downloading this barn owl to colour today I’m also giving you the chance to win a copy of this great colouring book. This gorgeous book contains over 30 astoundingly intricate illustrations of exotic and beautiful birds. Full of stunning line art for readers to colour and embellish, especially commissioned from young illustrator Georgie Woolridge. These artworks are especially designed to elicit creative meditation and aid relaxation, providing the freedom to create without pressure or judgement.Includes an introduction from the artist about her art, inspirations and techniques, as well as her travels around the world. You can buy the book on Amazon here if you live in the UK or here if you are in the US. I love sharing free colouring pages for adults on Crafts on Sea, why not check out some of these great downloads too! To enter this cool giveaway just follow the instructions in the Rafflecopter widget below, full terms and conditions of the giveaway can also be found in the Rafflecopter widget. Good luck! A dolphin would be lovely! We’d like to colour in a puppy, my niece is dog mad. I’d love to colour a deer, they’re so pretty! A parrot – so many colour options! A cheetah – magnificent big cats.